My morning name on the 5th, a line from a familiar hymn (“Come Thou Almighty King” / “Come, Thou Almighty King” / “Come Thou, Almighty King”), sung to the tune known as Moscow, Trinity, or Italian Hymn. Surely not by accident, an album of familiar hymns was playing on my iTunes when I woke up — but “Come Thou Almighty King” had not been played. Yet. While I was checking the playlist on my computer the hymn came up. So I seem to have been prescient. 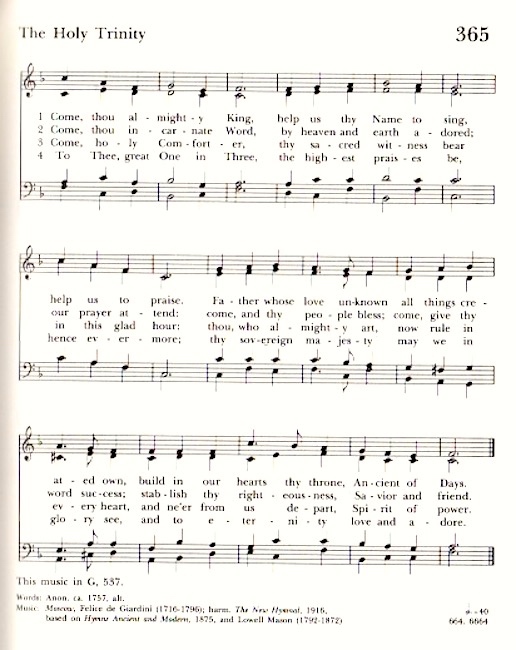 “Come Thou Almighty King” is a popular Christian hymn of unknown authorship, which is often attributed to Charles Wesley. 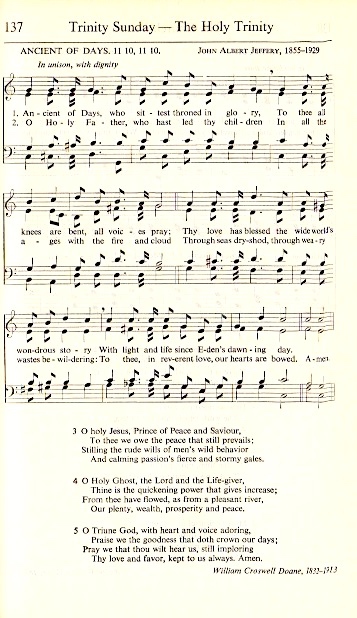 … “Come Thou Almighty King” is usually sung to the tune “Italian Hymn” (also called “Moscow” or “Trinity”), which was written as a musical setting for this hymn by Felice Giardini at the request of Countess Selina Shirley. 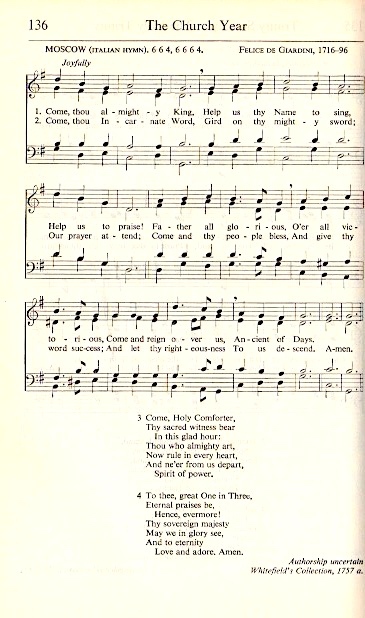 This hymn tune along with three others of Giardini’s were first published in Martin Madan’s Collection of Psalm and Hymn Tunes, 1769. The bare tune (as above) is frequently ornamented by passing tones, turns, dotted rhythms, and the like. Ancient of Days is a name for God in the Book of Daniel: in the original Aramaic atik yominעַתִּיק יֹומִין; in the Septuagint palaios hemeron (παλαιὸς ἡμερῶν); and in the Vulgate antiquus dierum. The title “Ancient of Days” has been used as a source of inspiration in art and music, denoting the creator’s aspects of eternity combined with perfection. William Blake’s watercolour and relief etching entitled The Ancient of Days is one such example. Quite a contrast in texts as well as tunes. This entry was posted on October 7, 2018 at 5:55 am and is filed under Art, Language and religion, Morning names, Music. You can follow any responses to this entry through the RSS 2.0 feed. You can leave a response, or trackback from your own site. Recalling learning to sing that in public school in a ‘burb of Atlanta in 1947. How times have changed! When I read your title I hoped you’d reproduce that William Blake engraving! 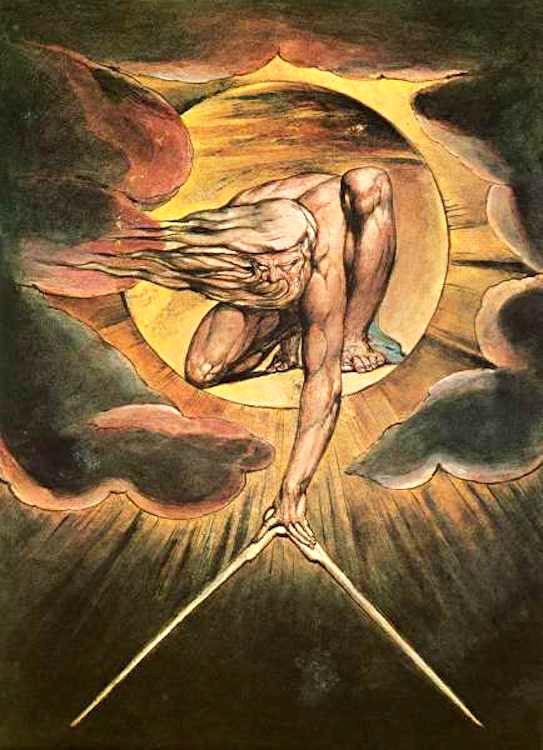 Urizen with forked lightning that evokes the medieval image of a compass, with the Creator measuring out the world.